The last thing Leo sees is a flurry of tetsu-bishi (tiny barbs) hurled at him by his Foot Soldier opponent. The barbs are tipped with a poison and Leo collapses. His head begins to swim and he prepares himself for an attack from his enemy. But the Foot Soldier just stands there, waiting. Leo gathers his faculties and realizes that he is completely blind. Leo is not unprepared, however, as he’s fought numerous battles in pitch blackness. The Foot Soldier attacks with his kusari-gama and Leo dodges. The two tussle for a while until the Foot Soldier flees down the alley. Leo suddenly senses two presences. However, the smell of cheap liquor and body odor informs him that the second presence is just a bum in the wrong place and the wrong time. They take their fight to a rooftop and the Foot Soldier addresses him. The Foot Soldier asks if Leonardo remembers who he is. In a previous battle some while ago, Leo blinded him. The Foot punished him for his failure in battle and made him a lowly weapons polisher. The Foot Soldier trained in secret to get revenge, becoming a master of blind fighting. Having fought so many Foot Soldiers over the years, Leo has no memory of this particular one and tells him to get on with the fight. The Foot Soldier vanishes from Leo’s four remaining senses; a technique Leo wasn’t prepared for. Leo focuses and eventually locates the Foot Soldier. The two clash, but Leo is at a disadvantage. The Foot Soldier sends him flying into a wall. Weak, Leo decides to use some psychological strategy and mocks the Foot Soldier, telling him he should have stuck to weapon polishing. In a rage, the Foot Soldier rushes Leo and Leo drives his sword through his foe’s chest. Leo is victorious, but then he notices the scent of cheap liquor and body odor. He realizes that the Foot Soldier was playing him the entire time and substituted himself with the bum at the last second. In shock over having taken an innocent life, Leo stands still and defenselessly awaits the killing blow from the Foot Soldier. It never comes. Leo realizes that this was all a part of the Foot Soldier’s revenge; to take his sight and then his soul. Leo reflects that even after all this, he still doesn’t remember who the Foot Soldier was. *The story continues in Tales of Leonardo: Blind Sight #1. *Chronologically, I would place this story arc during the “Mirage Volume 3” era. *This issue was originally published with an interview with Jim Lawson (conducted by Steve Murphy). 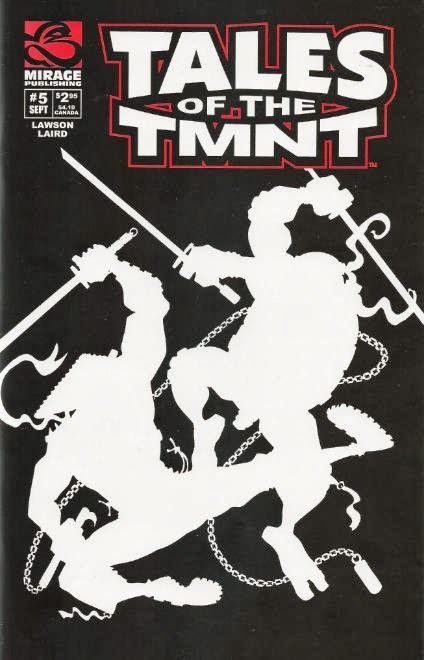 Apparently, Lawson didn’t take kindly to Steve Bissette calling him “an excellent draftsman” in the introduction for the 1989 Tales of the TMNT Vol. 1 trade paperback collection. *Matt Smith was mistakenly not credited for the letters page header in this issue. He received a credit and in apology in the editorial of the following issue. 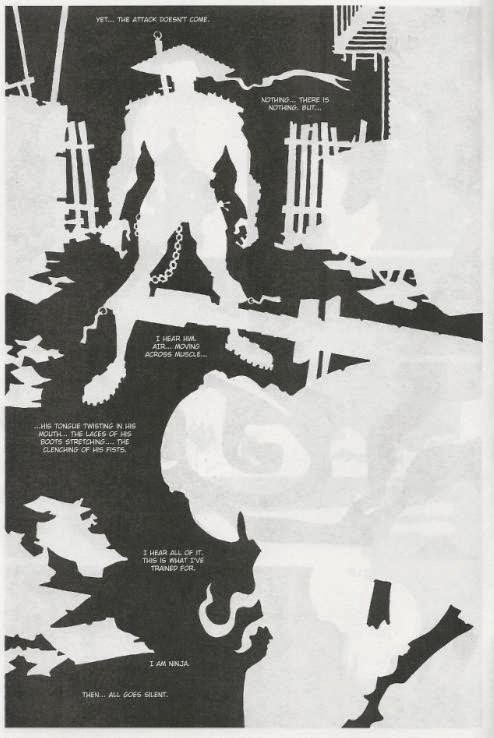 “Blind Faith” was one of the more visually innovative issues from the first year of Tales Vol. 2. 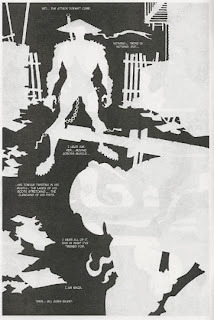 I’m sure the high contrast black and white silhouette gimmick had been done before (Lawson says as much in the interview), but this was my first encounter with it. It works well with the story, drowning out all environmental detail so that the reader’s focus is exclusively on the two characters doing battle. In a way, you step into their shoes, as they’re also endeavoring to blot out all distracting elements and “see” only their adversary. The style gives Lawson a greater deal of control over what distracts the reader. 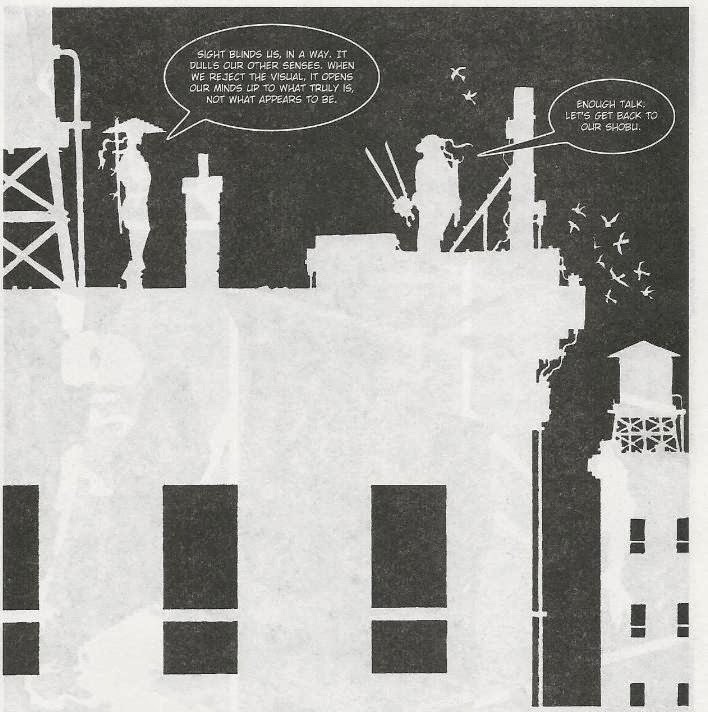 During the rooftop fight, Lawson includes the silhouettes of fluttering pigeons as well as leaves and paper rustling in the wind. There are no sound effects nor any acknowledgment in the inner monologue to point them out, they’re just there to show that they’re potential distractions from Leo’s concentration. It’s subtle but effective. The story is also one of those rare times when the Turtles flat out lose the battle. The blind Foot Soldier achieves a crueler, more meaningful victory than just killing Leo; he robs him of his confidence, his peace of mind and his sense of moral superiority. While I normally eschew any contrivance drummed up by the villain to keep them from killing the protagonist when they have them at their mercy, the situation really worked and you do feel that Leo has truly lost big time. I enjoyed the anonymity of the Foot Soldier, too. He’s never named or seen beyond a silhouette. And there’s no editor’s note to tell you what issue he previously fought Leo in. The point is that Leo has fought so many Foot Soldiers over the years, it could have been one of a dozen different fights. But while all the Foot Soldiers blur together in Leo’s memory, the reaction is very different on the opposite side of the coin. This Foot Soldier obsessed and plotted for years, all without Leo knowing, remembering or caring. Again, it robs Leo of any sort of peace of mind. How many other foes has he completely forgotten about who could be out there plotting a horrible revenge? 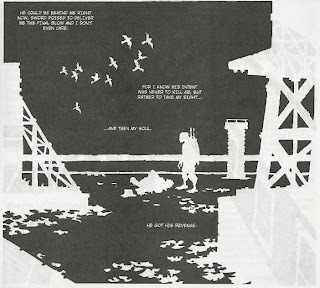 “Blind Faith” is a superb oneshot story that really stands out in the crowd. Unfortunately, it got a 4-issue sequel. I gotta ask, is the "minus" in front of your A grade a foreshadowing of what came next with the mini-series?